As many as 8 million people in the U.S. have already been exposed to asbestos and it continues to pose a serious threat to workers in certain occupations. This website is designed to provide medical advice or is intended to be for educational use only. 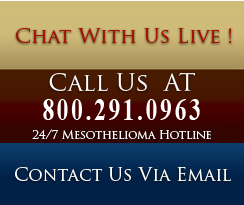 The information provided through Mesothelioma Help Center is not a substitute for professional care and should not be used for diagnosing or treating a health problem or a disease. If you have, or suspect you may have, a health problem we can refer you to a mesothelioma doctor or lawyer in your state.